After extensive research born out of necessity (i.e. my makeup was running out), the best 5 foundations have been selected out of 20 something I tried myself. The selection criteria were: 1) coverage of uneven skin tone, 2) masking fine lines, 3) natural look, and 4) long lasting. The best for 30-somethings as this is so far the only foundation that efficiently soften fine lines. Convenient click-pen foundation brush which means saving on a makeup brush! Complete elimination of shadows and instant skin illumination. Great for dry skin. Light and silky. The best for mid-20-s. Also great for oily skin. Creates a fresh, refined and natural complexion which lasts. Quite economical as you need only a tiny drop for your makeup. The fluid formula has a soft, light texture which feels fabulous. SPF 15. Evens out skin tone perfectly and creates a radiant complexion. Contains moisturizing regulator for optimal comfort. Great coverage, waterproof and long wearing! Best protection – SPF25 but its texture feels heavier than other foundations in the Top 5. Same as By Terry foundation, this YSL is made as a brush applicator. Flawless, even and naturally radiant finish with sheer coverage. However, this foundation is more visible on skin than By Terry and Chanel. Hydrating and a non-comedogenic formula. Perfect for those who frequently find themselves in front of the lens. Includes micro-pigments that catch light, hide fine lines and imperfections. Silky smooth and moisturising texture. To be completely satisfied with this product you should have a fairly good skin as it provides only a sheer coverage. Girls, I would highly recommend investing in a quality foundation as flawless complexion is the most crucial element in looking beautiful. Better save on mascara, pencils, etc. 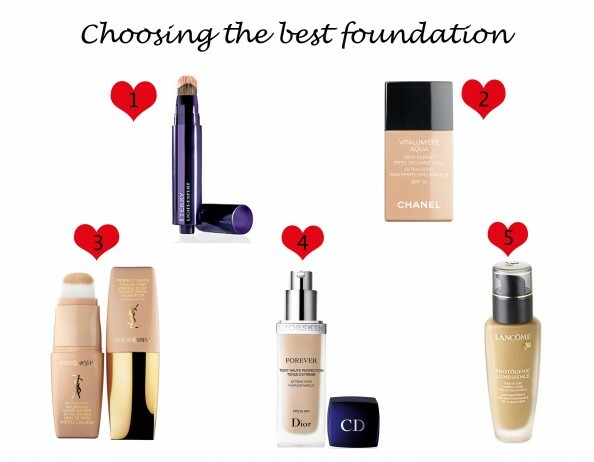 Research on price and buy foundation online (much cheaper than in retail! ), while retail cosmetics stores are great for consulting to select the right colour. What is your favorite foundation or do you have any tips on how to choose the right one? Share with us – we would love to know! Thank you so much for this post. I loved it!!! And you’re gorgeous! Thanks for this post… I’ve been using Bare Minerals for ages, but lately I feel like it’s not enough coverage… By Terry and Chanel are more than I might typically spend but I’m inpired, your skin looks great! Hi u have a wonderful Blog…I am following u..